At work we talked today about greening the email process, with some reporting that they are forced to print emails unnecessarily because they don’t have time to organize their Outlook, and consequently fill up their allotted space. Courtesy of my good friends in I.T., here are some easy steps they suggested to avoid needless printing. Use the tools available in Outlook, starting with “off-line”. 2. You’re so darned popular! You can’t get to the huge amount of emails you receive daily as fast as you’d like to. The Solution? Create a “rule” to move emails or a certain size, or from certain people to an off-line folder and sort your emails from there. You might title it “sort” or something like that. 3. Size matters! You don’t get many emails but somehow you still fill up your allowable space. The Solution? Consider the size of your emails, not the amount of emails in your inbox and sent folder. One decent sized attachment can take up a disproportionate amount of allowable space. 4. Empty your “sent” file! You may empty your deleted file regularly, but you still get the “mailbox over limit” message. Consider this – if you forward an email you have received with an attachment it is now taking up the same amount of space twice – in your inbox and in your sent file. Tip: try sorting your emails by size, then move / delete / deal with the largest emails first. Make a point of regularly checking your “sent” file then file offline or delete sent emails. 5. Who cares who read what? If you’re tracking read or deleted emails you’re filling up your inbox with “read” receipts or “deleted” notices. Do you really need to know that I deleted your heartwarming “fwd: This will make you cry” email two minutes after you sent it to me? Do you really want to know that I deleted it without reading it? Really? 6. You’re not using your off-line. The solution? Start using it. We’re not getting any more space on our Outlook, they’re not growing trees fast enough for the paper we’re printing, and they’ve run out of decent plot lines (if they ever had them) so there isn’t going to be another “Fast and Furious” sequel. These are painful truths. Deal with it. "It is estimated that 97 billion e-mails whisk through cyberspace every day. And according to GreenPrint Technologies, despite 20th century predictions of a paperless office, North Americans use enough sheets every year to build a 10-foot-high wall that would stretch from New York to Tokyo and beyond..."
It was in Atlanta, a restaurant called the Southern Kitchen. It was lined up so I sat at the bar and asked the bartender to bring me something to eat that would make me go back to Canada and talk about his restaurant. He started with a drink that was fantastic and to this day I don't even know what it was. Then he asked me what kind of food I preferred, and I told him I would eat WHATEVER he put in front of me and love it. So he asked me to narrow it down to three choices, and the third was Fried Chicken. That was the one I didn't want, thinking I'd end up with KFC. So asked him which of the three he would have for dinner if he could. He told me that if I left Atlanta without trying the Fried Chicken it would be a shame and that he would definitely have the Fried Chicken for dinner if he could. So I ordered it, even though I wouldn't have ever chosen it off the menu and I really didn't want it. But, if you're going to trust your server, then you trust your server all the way. He told me it was going to be the best chicken I would ever taste. Turns out he was right. It remains to this day the very best experience of a server who knew his menu, appreciated his customers and was proud of his work. It was nothing like what I expected and every time I think about it I just want to jump on a plane, head down to Atlanta and order it again. And here's the best part. I ate at the Southern Kitchen because a friend recommended it. It had been recommended to her and she loved it. And now I recommend it to you. After yet another dismal meeting with no agenda, no minutes from the previous meeting, and not surprisingly, no results, I long for the day when meetings are only held because they are the best course of action in the specific situation. So this really rich guy from Windsor puts down a million and a half on some sort of fancy sports car, and the Detroit dealership allegedly runs away with his money and doesn’t turn over the car. This makes the front page of the local rag and the reaction from the hoi-polloi is to criticize the newspaper for making it the lead story, and the rich guy for being so…rich, I guess. Here’s my reaction. First, let that be a lesson to those among us who would put down a 100% deposit. I say hold back a couple of hundred thousand to make sure you get what you ordered – the colour you wanted, the CD player, that sort of thing. Secondly, let’s call the criticism what it is: envy. Who are any of us to tell this self-made billionaire how he can legally spend his money. Would we really have the employees of the auto company go jobless while he gives the cash to charities instead? What if our town made high-end sports cars instead of minivans, how would the tune change? And third, it is front page news. How many people do you know who can spend that kind of cash on a car? Many of us have met this man around town and didn’t even know he was a billionaire. His company, Atlas Tool employs several hundreds of people. He is an entrepreneur who has opened several successful businesses in the area, a philanthropist, he has endured great personal tragedy that would sideline a lesser man and kept his family and businesses together, and by all accounts is a great guy. And his reaction to all of envious reaction to his misfortune? He hasn’t said a word, but hopefully, Atlas shrugged. My son and I have had our eyes on this one for awhile, so when I finally got my chance to try it I was still tossed between which naughty pleasure I would enjoy while in Toronto for a convention ; Hooters (for the chicken wings, of course) or this poutine specialty restaurant. I went for the poutine. (Less to explain if your wife finds you dead of a heart attack than if she finds a Hooters receipt in your wallet). The menu is basically a whole bunch of different combinations of stuff you can put on standard poutine, which of course consists of fries, curds and gravy, eh? I had the pulled pork on top of the heaping mound of poutine. I may never eat again. Heck, I may never see my feet again. Good - fresh cut fries, hot gravy, real curds. Some places try and get away with using mozzarella cheese just because it's white and melts up real stringy. That ain't right - it's supposed to be curds. This place uses them. Great - Pop Shoppe Pop in the bottle. I had the Cherry Cola. Aaahh, the memories. Room for Growth - I deliberately don't name the restaurant because I don't want to wrongly accuse, or seem to accuse. Cashier / order taker / cook working alone rang up my order with cash drawer open. When I asked for receipt he had to ring it up again to print the receipt. Typically that may mean that a) that cash was never destined for the cash drawer, or b) the taxman ain't getting his full share because not all sales get recorded, or c) cashier is correcting a previous error by not getting management involved. No matter how you slice it, this is a danger signal that could mean that this place won't be around much longer if controls aren't in place. The owner probably can't figure out why his sales are down and food cost is up. Glad I came when I did, I may not get another chance. I can only imagine how good this place is at 2 a.m. after a few brews. I'll let you know after the party tonight. 1. 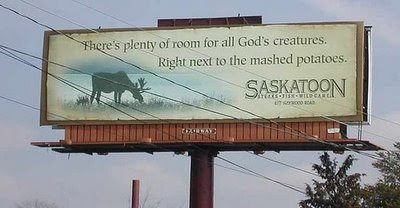 If I was going to name the place I would always say something good. In a few restaurants where this was not possible I have told the manager/owner in person and left it at that. 2. Never write about a friend's restaurant. 3. Never write about a restaurant in my own backyard. 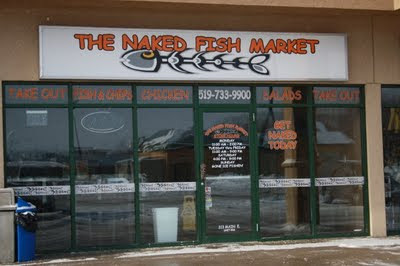 Today I break rules #2 and #3 to rave about The Naked Fish Market in Kingsville, Ontario on the shores of Lake Erie in beautiful Essex County. My friend Rob Taylor owns this little fish and chip shop. Rob and I go back 12 or more years in the restaurant business, and I have always appreciated two things about Rob - his creativity and his commitment to quality. That pretty much describes TNFM. The menu gives choices of several types of fish combos and other great appetizer and entree offerings (like Pulled Pork). I especially like the self-serve ice cream bar - buy your cone or cup and fill it as high as you want, one trip only. Rob says that's pretty popular with the kids from Kingsville High. The ambience is cool, with just enough "naked" references to make it fun without being scandalous. You can buy an "Eat Naked" t-shirt for $10, or trade in the one you're wearing and pay nothing. Rob always has a way of taking something ordinary and putting a fun twist to it. The place is small, busy, trendy, fun and fantastic. Rob is friendly and welcoming and putting everything he's learned from Red Lobster to Applebees and countless other smaller non-chain restaurants over the last decade into making this place work. He's clearly learned what doesn't work and left it out of TNFM. Working in the restaurant business can introduce you to some really amazing people and some pretty unsavoury characters too. Rob has his own story to tell about how he became the accidental entrepreneur after years of sweating it out in other people's kitchens, but I'll summarize for him. When life handed him lemons, he cut them into slices and served them with fish. I had the breaded fish and french fries and my wife had the battered haddock and fries. Both came with coleslaw. You can choose the number of pieces you want in a dinner and the price is reasonable. The fries are fresh!! It works. It's cool. Sure, it's deep fried trans-fat free so I won't be eating there often. But as the most interesting man in the world from those beer commercials might say, "I don't always eat fish and chips, but when I do, I eat Naked." 1. We're a microcosm of the Canadian experience. We can literally see how close Canada really is to the United States, we have a strong manufacturing base and a growing white collar base, we are agricultural and we are tourism and conventions. Fresh vegetables and fruits from the farm on which they are grown are no more than 30 minutes away for most Windsor residents. We are, however, a little light on snow and frostbite. 2. You can see next year's car models being driven around Windsor and Detroit. They're the head turning cars that have no name badges that make you wonder "what the hell is that?" Yesterday I saw a Volkswagon convertible sedan, might be a Passat. VERY cool! 3. We're fully bilingual. We speak American and Canadian. We drive in km/hour, purchase our gas in litres (when we're not across the border paying much less per gallon at the duty-free) and we measure the outside temperature in Farenheit degrees. 4. Good people do good work for their neighbours everyday in Windsor. Oh sure, we've got our share of movers and shakers (who are more often than not really just bobbers and weavers in cheap suits) but amongst the hoi polloi some very generous and caring people live. 5. We have at least one member in each level of government who really gets it. Brian Masse MP, Sandra Pupatello MPP and Bill Marra Councillor Ward 4 are straight shooters who are leaders among their peers. Good people. Worst greeting ever (at a restaurant last night after the movie let out). Waiter/Bartender charges to the door as my wife and I walk in: "The people behind you left the doors open, they should be shut," brushing past us and directing us to the doors. Me (confused): "What are you saying?" Him: "The kitchen is closed." I look at my watch, it is 9:20 p.m. on a Tuesday night. We leave, no further pleasantries are exchanged. We get escorted out. Since our public employees started back to work this week I have found them to be polite and thorough in our interactions. My garbage was picked up and the area left clean, and the staff at the municipal gym are more friendly and accomodating than they've ever been. I am also hearing that the city managers seem to be showing a generosity of spirit and a desire to show leadership in providing a welcoming and healthy workplace. In other words, everyone appears to be doing their best to get along with everybody else; staff, management and hopefully customers (taxpayers) alike. The only fly in the ointment is the squabbling at city council. This, unfortunately, was entirely predictable no one is paying any real attention to it. To paraphrase George Carlin's newsman routine about a publicity seeking fool, "nobody has noticed and nobody gives a damn." "The transmission of human life is a most serious role in which married people collaborate freely and responsibly with God the Creator. It has always been a source of great joy to them, even though it sometimes entails many difficulties and hardships." "Married love is also faithful and exclusive of all other, and this until death..."
I'll cut to the chase. It's a very good burger. I discovered the place when a friend of mine brought me there after a bit of a dispute over the In-N-Out recommendation. I happen to like fast food; Dean, not so much. He likes his burgers brought to the table by a waiter. So Mr. Fancy Pants brings me to The Works and I'm sure glad he did and I'm sure glad I came back last week. Great - The concept, the presentation! Full of attitude, lots of cool burger names and combinations to choose from, like "The Love Goat" (goat cheese +), "Sam and Ella" (Salmonella, get it?) and "Sum Yung Guy" (OK, that's still juvenile and considering the toppings, it's gross). I had the "Bruschetta Bomb" - and it was very, very good! As The Works describes it, they have 5 locations, 8 burgers, 66 toppings, 528 combos... This is Toby's Goodeats Toronto in the 80's to the power of 10. Something tells me the brains behind this operation enjoyed a Toby's burger or two back in the day. Good - The burger itself. Not too plain, not too seasoned. "You pick a burger - it doesn't have to be beef," our server tells us. "Oh yes it does," says I. You pick the combo. You pick the side. "It doesn't have to be fries," says the menu. "Oh yes it does," says I. The fries are hand cut and seasoned with sea salt. A little greasy this time - maybe the oil needed changing in the deep fryer, or the temperature of the oil was too low. Room for Growth - Very efficient and well presented server missed the opportunity for a little interaction. Frankly he was a bit stonefaced; friendly enough but not outgoing. He started out well with the "have you been here before?" question and the walk through the menu. Taking it up a notch with a few suggestions, and few questions about what we like and dislike would have earned him expert status and a better tip. We ordered water, but looking at the menu in hindsight there were a number of good milkshakes he could have suggested - he probably would have had the sale. He didn't, for example, offer us the opportunity to order a special burger not on the menu but advertised on the tent card that would have helped with fundraising for the hospital and earned me a chance to win a 1970 Malibu. I would have gone for that!! Trouble is, by the time you've gone through the extensive menu you don't start looking at the promo card until you're in the "waiting for my burger" zone, which incidentally isn't rushed but well worth the wait. The Ultimate Comment Card Question - will I come back? Yes, and hopefully while there's still a chance to win the Malibu. Even without a cool car and charitable connection, this burger stands by itself and I recommend you try it next time you're in Ottawa. Three things I have learned from the Municipal strike in Windsor, Ontario. 2. People went hungry. No matter whether you agree with the issues they struck for, people on the picket line did not bring in enough strike pay to even cover the mortgage, let alone car payments and food. You have to respect that there are still people in this society who are willing to sacrifice personally for what they believe to be the collective good and that isn't a bad message to be sending to the kids (bad behaviour from one or two idiots aside). 3. If you manage your garbage very carefully be composting, recycling, rinsing and considering the end result in your purchasing decisions, you can really increase your diversion rate from the landfill. I think we're all a lot more aware of how much garbage we produce because we had to haul it away ourselves. 4. A little wildflower growth ain't all bad. It's possible we've overmanicured the public greenspace and this strike has taught us that we don't have to be so damned pristine. 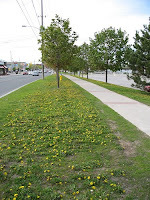 I hope that we'll let the grass grow in select areas by cutting back from the road a few feet and letting the rest get a little wild in a controlled fashion. It's a beautiful thing in the right places. You're not officially the Mayor of Windsor until the head of the CAW tellls you to "F-off!" That happened just last week to Mayor Eddie Francis, who promptly showed Ken Lewenza the door. Relax Eddie. That was just Kenny-speak for "I'm here to broker a deal in the 7-week strike between CUPE workers and the city, and I take you very seriously." It's simple. When Ken Lewenza tells you to "f-off", you return the greeting, hug it out, get down to business and go for a beer together after you get it all worked out. You know, there’s something to be said for the way Donald Trump does it on the Apprentice every week. A team messes up and comes in second place. The leader is asked to account for what happened. If the leader can’t make a great case for why their subordinate is to blame in spite of development, direction and delegation, then logically the leader is to blame. The failure may be due to a lack of development – the subordinate isn’t ready for responsibility. It may be due to lack of direction or relevant supervision or follow up – the subordinate doesn’t know the plan or doesn't know he doesn't know. In the worst case, it may be due to a lack of delegation – the micromanager who just can’t let go. Or too much delegation too soon - the macromanager who needs to get a grip. In real life and beyond extenuating circumstances you get a second chance and a third chance. However, if a pattern of failure is evident, sooner rather than later somebody needs to hear the words “you’re fired”. The leader, after exhausting all reasonable options, either says it or hears it. It’s not personal, it’s just business. Behind the leader's back there is a culture he or she has created and the stories are told and retold of things he's said, things she's done. No amount of coaxing, cajoling, threatening or bribing on the boss's part could ever get those stories told to his or her face. If you're the boss, you'll never really know what people are saying about you when you're not around. If you have been an amazing leader, like a lady I once reported to, the legends speak of compassion, vision, determination and fairness. Sometimes the stories are not so kind. You might be surprised which of your behaviours your subordinates least respect. You might be surprised to learn what they notice, which of your behaviours they model and which they wouldn't touch if you paid them. It seems to me that one way to succeed in leadership of people or to be a sales or service leader might be to ask yourself what kind of stories you want told behind your back, and then govern your behaviour to fashion the tale. Do you want to be known for your integrity and loyalty? Want your team to be people with a good balance of priorities? Want truth and conviction in the workplace, a commitment to excellence and top-of-mind customer awareness? Do you want your company to succeed? Be the servant leader who demonstrates daily what the company values really mean. Have lunch in the company cafeteria and fly coach. Be loyal to your spouse and to your family. Go home when the job is done, turn off the Blackberry and spend some time with your family and friends. Volunteer in the community with a cause you really care about, not necessarily the glamorous cause-du-jour. Skip the galas and the fundraisers and roll up your sleeves even when the cameras aren't present. We notice. We'll follow you anywhere. I have eaten at South Street Burger Co. probably 8 times in the last two years as I continue to seek my favourite burger. This one has a lot going for it, which is why I keep coming back. It's really good, but what stops me from declaring it my favourite? 1. If I did, I'd have to take up a new hobby. 2. And, there's room for improvement. But that's just my opinion - you should check it out yourself; you won't be sorry you did. I really want South St. to be the most amazing burger experience ever. It has a lot going for it, probably because of the drive and business savvy of Jay Gould of New York Fries fame. The burger is fresh and free from all fillers, antibiotics and other stuff. There are no heat lamps. The 1/3 pound burger is served on your choice of toasted white or whole wheat bun. The topping choice is simple, but it is your choice. Everything is made right in front of you, pretty quickly. They have a cool combo set-up - just choose a burger, fries and a beverage and they'll take a buck off the cumulative total and call it a combo. Good: The burger itself, the toppings, the fresh bun. It's just fine, but not memorable. I wonder if it is deliberate that it's not seasoned in any way I can taste. If so, I think that might be a mistake. The right seasoning could set this experience apart. Great: The fries of course. You can't have a great burger without great fries, and New York fries come with this burger. Room for Growth: A little more attitude. The decor is funky and secure with itself, the restaurant is spotless and the flow from cash register to assembly to presentation works just fine. But apart from the classic rock playing softly through overhead speakers, I can't find the "oomph" that makes this experience fun and different. I'm not suggesting they emulate Licks with all that singing and yelling, but they could turn up the tunes and have some interaction with the patrons other than the topping conversation. Don't get me wrong, the staff are friendly and polite, but not outgoing. If they're allowed to smile most of them haven't gotten the memo. Would I come back? As it stands, South St. is an upscale Harvey's. Nothing wrong with that, but I don't think that was the goal. Yeah, I come back but I haven't recommended it. If South St. Burger Co. took it up several notches in the energy department, I'd bring friends and family with me next time and every time! The entrance to our city has long been an eyesore, and our Parks and Rec people have undertaken in the last few years to do something about it. That's fake grass, and it's not going well with some residents of the city. I think it's a big improvement over what was there before. A scene like this is what we're faced with everywhere else in the city since the outside workers walked off the job. I had the pleasure of dining at Milestones on Dixon Road in Toronto last week. I was in town for a quick trip with meetings out near the airport. I arrived hungry and looking for a decent meal. Milestones is a step up from Kelsey’s, but not a big step. The meal was worth the money I paid, and the atmosphere was upscale roadhouse friendly. The greeting was friendly but not outgoing or conversational. She wasn’t a natural hostess, and a little effort could have taken it past a pleasant acknowledgment of my presence to a welcoming invitation to dinner. Good – the steak and shrimp special was quite nice. It was cooked a little on the rarer side of medium-rare, but I’m just not that fussy. The shrimp was a bit of a disappointment. Six medium-small shelled shrimp broiled and placed on top of the steak. This would have been a real wow if it were two jumbo shrimp, tail on, grilled. Then again this is upscale roadhouse, not casual fine dining. Great – friendly service from the bartender, efficient and pleasant. He knew his menu and suggested the special, which really helped him establish himself as knowledgeable committed to a great experience. Not to overstate the potential, but his enthusiastic recommendation of a good special got him the extra sale of a fantastic decaf Cappucino at the end of the meal. The higher the bill, the higher the tip. Room to Grow? He didn’t know his wines. I asked for a recommendation with my meal and he brought in another server to make a suggestion – which was GREAT! The room to grow is that she didn’t tell me what she had selected, and I had to ask. The bartender could really take it up a notch by knowing his wines, suggesting a good one, telling me what he selected and why, and establishing himself as a trusted expert. Follow up with an invitation to come back next time I’m out by the airport and I’d definitely make a point of it. Would I come back? Yes, the meal was good on two different visits to Milestones. Service was outstanding in London, average (with the potential for great) on this occasion. I wanted to tell you about the “Complaint Free World” seminar that some friends and I attended together. Will Bowen, a Pastor at one of those new-age churches came up with the idea while preparing a sermon. The plan was to get everyone to wear a rubber band on one wrist, and every time they verbally complain switch it to the other wrist. He figures that if one can go 21 days without switching you will have formed a habit of not complaining and be a nicer person because of it. Actually, it’s quite fun to try and he gave good examples of the difference between complaining and stating the facts. If you tell the waiter your soup is cold, it ain't complaining, it's stating a fact. If you tell your dinner partner but not the waiter, you're complaining. My only criticism of Will Bowen is that he left the religion out of it. I know he has to in order to speak to so many people and get buy in, but couldn’t he at least attribute his source? Presumably if the idea came to him as he prepared for a sermon, surely it was inspired by scripture. I sure hope so, because if it wasn’t then the whole point of the Sunday sermon was missed. These are the thoughts I gleaned from his lecture, then. First, I really am working on not complaining thanks to the method he teaches. Secondly, though, is that when one preaches no matter how brilliant an idea he might have, if independent of God it can’t help but fall short. 10. Good health. I'm in good shape. I did 50 pushups this morning just for fun. 9. Most of the people I hang out with socially think I'm just a kid (in comparison). 8. People over 50 get it when I tell them our three kids are named Vera, Chuck and Dave. One of my kids gets it, too. 7. If you're 50 plus you've probably seen original episodes of The Brady Bunch, Star Trek, Mission Impossible, Batman and Lost in Space. 6. The Mayor of my city, the Prime Minister of Canada and the President of the United States are all younger than me. 4. At this point my future boss at Wal-Mart has already been born. And someday I'm going to be the best damned Greeter that place has ever seen! 5. Hawaii celebrates its 50th year as a state this year. Coincidence? Yes. 4. I've been married for more than half my life. The better half. 2. The ladies in the Catholic Women's League think I'm a nice young man. The Missus and me just got back from Hawaii. I've been promising to take her for more than 25 years, but frankly never had the money. By a combination of luck, low prices and being down to only one dependant, we had a few bucks to spare and we headed to Hawaii to celebrate our upcoming fiftieth birthdays. We called it "The Hawaii Five-O Trip". It occurs to me that Hawaii is a lot like a good marriage. When you first get there you are overwhelmed by the sheer beauty of the place. The flowers, the jungle, the sea, the sky... breathtaking. It's a lot like "being in love." I would imagine that if you moved to Hawaii you couldn't possibly survive having your breath taken away every day. Neither could your marriage survive very long if you felt as "in love" as you did the day before you were married, every day thereafter. There'd be little time for anything else but breathlessness. So, in Hawaii and in marriage, you get past the sheer wonder of it and start living in the "here and now" of everyday life. But occasionally I bet you step out your front door in Hawaii and notice how beautiful your surroundings are, or maybe driving home one night there's an awesome sunset, or maybe on your day off you go for a swim in the crystal clear ocean and remember why you fell in love in the first place.